As the number of electric vehicles (EVs) continues to increase year on year more and more condo associations are fielding requests from condo owners to install charging stations. While it might seem like a straightforward request that would elicit a straightforward (and positive) response it turns out it’s not that simple because many condo board members are simply not familiar with the technology or what’s involved in a condo EV Charging Station installation. At EVdirect we encounter this type of situation on an almost daily basis and find that nothing breaks down resistance like a few facts and a clear presentation of the benefits. Why Condo EV Charging Station Installation is a Good Idea? Attracting high-value, environmentally conscious residents. Enhance the profile of the development from a marketing perspective. Bring the development into step with the government’s “green” initiatives. Encourage environmental responsibility among the resident population. Increase property values with minimal investment. Electric vehicles represent an ever increasing percentage of vehicles sold every year in Ontario and it’s estimated that within 3 years there will be nearly 20 million of them on the roads of the developed world. EV owners are typically affluent, responsible consumers who make up an ever larger percentage of condo buyers with every passing year. And they want to charge their EV where they live. If a particular condo development does not offer them the ability to do so, they will find one that will. So getting on the condo EV Charging Station installation bandwagon today only makes sense from both practical and marketing perspectives. Personal EV charging stations that enable EV owners to charge their cars right in their assigned spot. 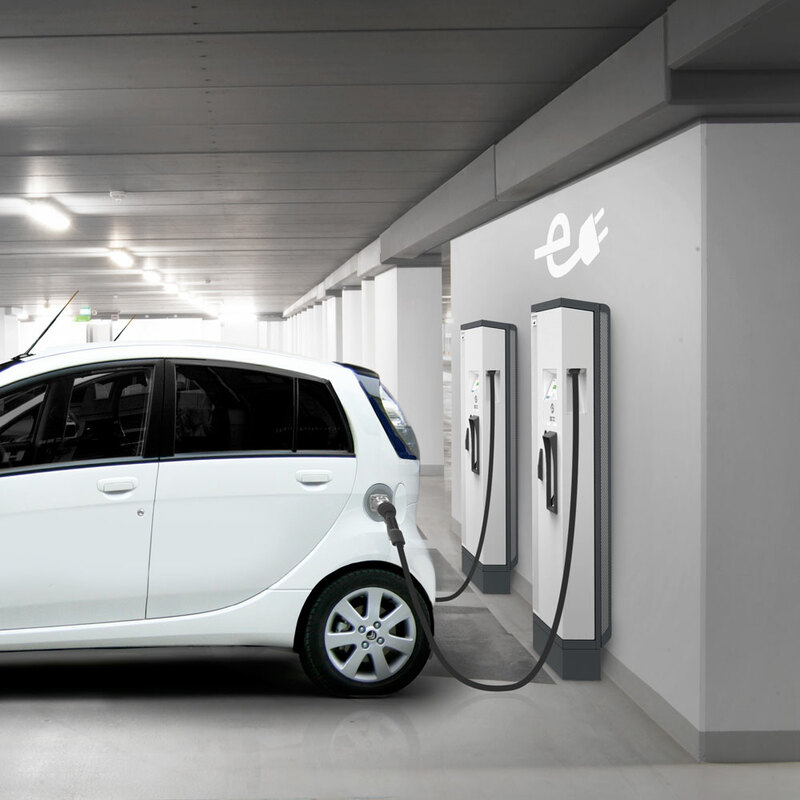 The individual EV owners pay for both installation and maintenance as well as any electricity consumed so there is no financial burden on the other members of the community. 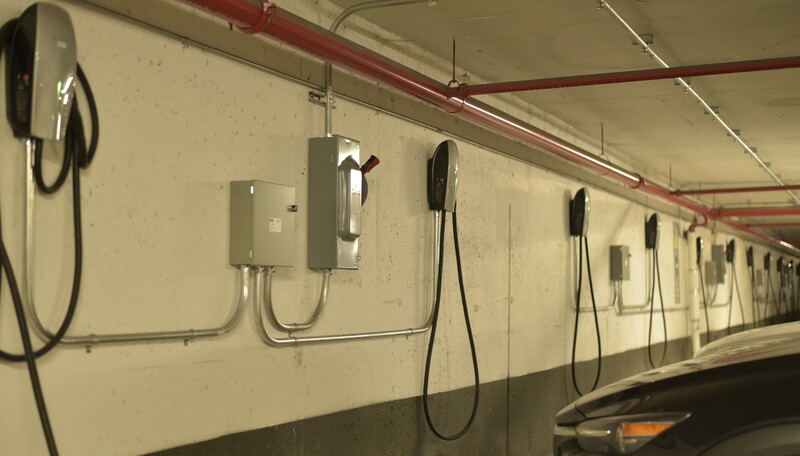 Community EV charging stations are easy for our licensed electricians to install and allow the condo board to set access policies and to charge fees based on a range of criteria including time of day, session length and electricity usage. These stations can be made publicly accessible and generate usage fee income that can be used to offset the cost of the condo EV Charging Station installation. A Guiding Hand – We help our clients every step of the way by taking charge of the permitting process, installing the high quality EV charging solutions that are right for them, providing affordable maintenance and some of the best customer support in the industry. Private or Public Charging Stations – We offer both private and public EV charging solutions tailored to the needs of the particular client. With a reliable, high performance charging station at your fingertips your entire EV experience is enhanced. Building Long-Term Value – Both home and business enjoy enhanced value through the installation of this forward-leaning technology. For a reasonably modest investment you’ll be able to future-proof either your home or business. Those who hesitate to purchase an EV often do so because they believe they’re more expensive to run than a gas-powered vehicle. These people are often startled to discover that gas-powered cars cost about 3 times as much to run as electric powered cars, given the current average prices of gasoline and electricity. Many condo association members make similarly incomplete or incorrect assumptions about installing EV Charging Station: in this case that the cost will have to be shouldered by all the owners and that the technology is hopelessly complex. But neither is true. Give EVdirect a call today and find out more about the many benefits of condo EV Charging Station installation.